After doing so much to establish the current popularity of quarterscale WW1 aircraft modelling, it’s been a long time since Eduard released a new kit. So, unsurprisingly, there was considerable excitement when the company announced it’s new-tool SSW D.III - subject of its earliest kit that marked the point when Eduard began to expand from being an aftermarket producer to become a short-run kit manufacturer. A lot has changed since then, with the company firmly established as one of the “majors” - consistently producing some of the finest moulded and detailed kits available today. The new kit arrives in a typically stylish Eduard “ProfiPack” box, with the sprues and accessories bagged separately for protection in transit. The top-opening box is quite compact, so it’s something of a surprise to see how much free space is left inside around the two densely packed sprues - an encouraging sign that, even in 1:48, the SSW will be a perfect choice for those of us with limited display space. As you’d expect with a modern Eduard kit, the moulding is quite superb. It’s something of a shock to the system to see the new dark grey replacing their traditional linen-coloured styrene, but the result does look undeniably classy. There’s no sign of any flash on the sample kit, and the designers look to have kept ejection pin marks out of harm’s way. I found just one sink mark, which I’ll discuss below. Slide moulding has been employed, and the result is exquisite open vents and louvres on the fuselage belly and the spinner. The surface detail comprises engraved panel lines on the fuselage, with neatly raised appliqué panels, plus crisply defined ribs and lacing on the fabric surfaces. As impressive as the latter detail is, it looks overly prominent to me, so I'll knock it back quite a bit, together with the raised rivets on the faired struts. Obviously, there’s only so much you can dry assemble on a kit like this, but the fuselage clips together neatly and sits well on the full-span lower wing to give a good, solid, basis for the build. The stabiliser slots in quite neatly, and includes the rear tip of the fuselage behind the fin, so it might need a smear of filler to hide the seam. The kit measures up pretty well against the plans in Windsock Datafile 29. The tailplane span is a bit less - but, unless I can verify them personally, I always treat drawings as a useful (rather than absolute) guide, so I’m not going to worry unduly. The interior is very comprehensive, with around 40 parts including quite a detailed representation of the fuselage framing, a choice of styrene or etched seats, an etched harness, and decals for the minimal instrumentation. Under the separate top decking, there’s ammunition storage and feeds, while the rear of the firewall is detailed with the engine mount and fuel tank. The guns are provided in two styles - solid-moulded or with an etched cooling jacket and, hardly surprisingly, the etched jacket looks much better than the moulded version. In either case, there are optional metal items to add to the guns' bodies if you don’t mind a little simple surgery to trim away the moulded details, and you could always transfer the sights from the etched versions to dress up the the solid guns a little if you do want to go with them. The engine is undeniably rather simplified, comprising just three parts, with rather “clunky” cylinders and very overscale pushrods. The front of the crankcase also has a small sink mark which will be awkward to fill. However, tucked away behind the front support frame and large spinner, it’s effectively hidden from view anyway. So, while it’s not good (and something Eduard do need to watch out for), it’s hardly the end of the world. The firewall fits well, but has a simple, curved, opening for the vent over the lower louvres. Vintage photos show a larger vent split by a vertical support that echoes the front frame, so I wonder if Eduard have used Cole Palen’s D.IV replica on display at Old Rhinebeck as a reference, as that matches the kit’s firewall very closely. The 4-bladed propeller is crisply moulded, and its prominent spinner has open louvres. Purists may want to thin them for a truer-to-scale appearance, but hats off to Eduard for including them. The instructions are very well produced as a glossy 16-page A-5 booklet. The assembly diagrams are clear and straightforward, with Gunze Sangyo paint matches throughout. Two pages are devoted to rigging, showing the completed airframe from four alternate angles - a nice way of doing it, and a very handy help, because no less than 40 of the etched parts are tiny turnbuckles and eyelets. So far, so good - but you’d have to have been living as a hermit to have missed the criticism that’s come from all quarters over the lozenge decals. I presume it must be deliberate on Eduard's part, but the hues are so palid and washed out, it's almost as though one is looking at the decals through mist. If it's an attempt at "scale" colours, it's misplaced in my opinion (not least because the other decals aren't treated in the same way), and the decals completely lack the vibrancy one would expect. One good reference for just how rich original lozenge colours could be can be found HERE. In terms of quality, the decals are excellent - they are printed by Cartograf, so they are bound to be. The registration is pin-sharp, and excess carrier film is almost non-existent on most items. 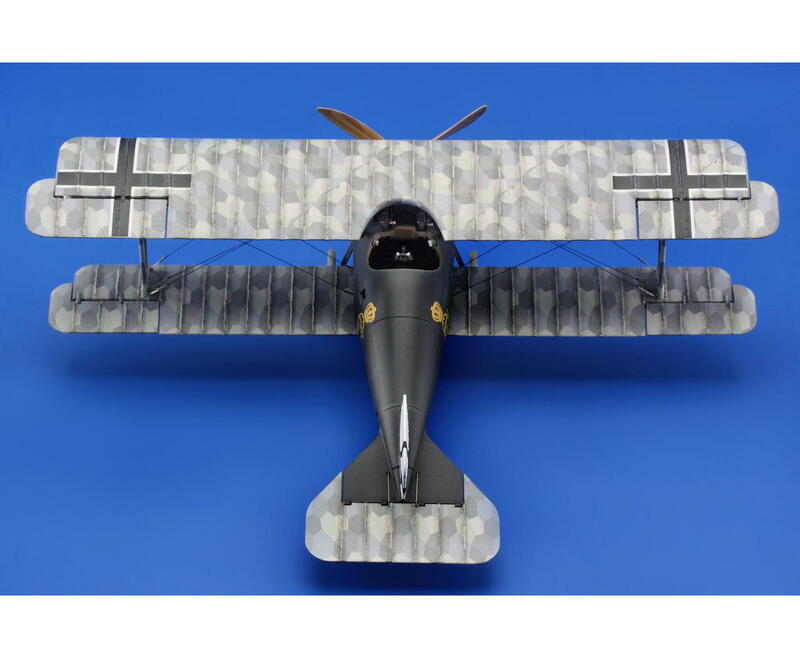 The lozenge panels are "cookie-cut", making application much simpler - but, sadly, I just can't see most WWI modellers wanting to use them on account of the colours. Barring a few minor grumbles, Eduard's new SSW D.III kit is basically superb - beautifully moulded and well detailed - but I'm just left wondering what on earth happened with the decals. The kit is well priced at a shade under £20 in the UK - and, if the lozenge decals had been better, it would be a superb bargain because they are very expensive to produce. As it is, while there are plenty of aftermarket alternatives, you could spend as much again replacing the kit decals. It's a real shame. Highs: Beautifully presented and moulded. Excellent level of detail in most areas. Cartograf decals. Some rather exaggerated surface details. . .: Ok, The reasoning behind the "exaggerated details on the wings is that the details will probably get covered in one of several manufacturers lozenge decals. Especially the rib caps. They get covered twice. Once with the overall cover and then the rib tapes. Can someone give me an unh-hunh? When completed the details will be softened sufficiently. Eduard's decals are more that suspect at this point. To keep it simple, the decals they used in the examples are apparently not the same colors as the ones in the production issues of the kit. Even the rib tapes are narrower on the built example. Eduard has not always been careful with built examples. Remember the Dr.I with the canted landing gear. It was soon replaced with a better example after the 1136X kit review by the way. In this instance it appears that Eduard's "example" kit builder knew the decals were too "faded" and over compensated by trying a darker hue. Possibly overspraying a dark color and cutting down ribtapes by half width. That would be the easy answer. There are three of us discussing this as we build the kits for reviews. No worries. Its just a difference of opinion. The engine aside and even with the decal & other issues it is still a kit to get. The fit is good. No warping in the plastic. Just make sure you add the firewall before you close up the fuselage entirely. Eduard seems to be listening buts more like one step forward, one step back. They have tried to remove the glazing over their lozenge, but is still oriented the wrong direction. The profiles are a bit flawed. A. SSW D.III, Possibly may have been assigned to Ltn. Seppl Veltjens (NOT Vallendor) of Jasta 15/ J.G.II as his reserve aircraft. The headrest identifies it as a machine from the first series of 18 that went initially to JG II. The balanced ailerons show the photo reference was taken after it was modified at the factory, upgraded with a new engine, wings and other modifications. Eduard’s “historians” have taken a page from the Datafile #29 (page 23 to be exact). And because Greven’s Jasta 12 machine is said to be photographed at Cher-les-Pouilly they have wrongly assumed the images below of our “V” marked SSW D.III are at the same location. But the other aircraft in the background in the bottom image are late model Albatros D.Va types. By July – August 1918 Jasta 15 had all Fokker D.VII machines assigned to it. The truth is we really don’t know what unit it was reassigned to. B. SSW D.III 1611/18 is a machine from Kest 4b. Their unit marking was a black cowl.